Color-coding is an important part of any food safety program. Not only does it help prevent cross-contamination due to pathogens, allergens and foreign contaminates, color-coding has a variety of other uses. With the number of governmental regulations growing, it is essential that food processing facilities stay on top of the current trends and best practices to be market leaders. Implementing a color-coding program is a great way to help accomplish that. Recalls are serious business. No one wants to see a recall happen to their company, but it still happens far too often. It goes without saying that food safety is important for more than just preventing costly recalls. From the field all the way to the table, keeping our food safe has to be top priority. Knowing where food is coming from, and what happens to it on its way through your facility, can potentially prevent a catastrophic recall. The concept of knowing and keeping track of food products is known as traceability. Traceability means being able to verify where food has been every step of the way—from the field it came from, to the line it’s processed on and what truck carried it. It’s a complex chain of custody but necessary to monitor to protect consumers. Tracing the overall process is challenging and maintaining that same control over your own facility isn’t much easier. Many food processing facilities are large outfits with numerous people working different shifts, and some are small, localized businesses with few staff members. Trying to keep track of food’s movements can prove difficult for big processors and mom-and-pop shops alike, though traceability is important in every single production facility. Having color-coding in processing facilities enhances the level of traceability. Having a color-coding system helps track tools within the facility, making food that much safer. If you use red for the raw meat zone, then you know that a red tool in the yellow zone, which is for processed food, is a contamination threat. You can then take steps to remove the potentially contaminated food from that area. This is much easier than trying to remove contaminated food after it has left the facility, which could cost millions of dollars. The benefit of having tools that are completely color-coded is that they provide instant recognition. To immediately know the origination of a tool is vital to preventing lost time, production shutdown and delays. Having tight traceability in food processing facilities not only diminishes the chance of a recall, it also helps keep your facility on time with deadlines, helps the bottom line and looks good in the public’s and regulators’ eyes. To effectively trace food through the system, there must be consistency between all levels of movement. From the farm to the table, everything should be documented for the highest level of traceability. With the technology we have at our disposal, there is no reason not to be able to considerably reduce the number of recalls we see. Food processors should urge their suppliers to practice the same level of consistency with food safety. You may not be able to control what happens outside your facility, but you can choose to use suppliers that follow best practices. The environment in a food processing facility can be chaotic. This is compounded when you bring multiple languages into the mix. Trying to keep everything organized and streamlined can be a daunting task. Having a color-coding program in place can help eliminate some of the confusion that can arise from language barriers. Whether you have just one employee that speaks another language, or 500, color-coding can help to keep efficiency high and mistakes low. Because colors are universal, no matter what language someone speaks, they are going to be able to tell one color from another. Red is red, even if the word itself is different. If red is for the raw zone, and someone who speaks a different language sees a red tool in the blue zone, they know immediately that something is not right and can then take appropriate actions. However, if no color-coding program is in place, and say, for instance, the method of communication is to have labels on the tools stating what zone they belong in, that employee might not know for sure if that tool is supposed to be there or not. With this kind of system, any time spent confused is loss of work, or worse yet, a cross-contamination hazard. Better to have a proper system in place to begin with so any problems can be fixed as soon as possible. But, before you assign colors, remember there must be good documentation and communication of zones. This goes for all people, no matter the language. There must be signage and internal communication that clearly states what these different colors mean, and what the appropriate steps are when something goes wrong, in all languages spoken in your facility. Once everyone is on the same page, your color-coding system will work better. What about those who can’t see colors, you might ask? Color blindness can affect about 8% of men and 0.05% of women. Depending on what kind of color blindness your employee has, choosing colors that have a high contrast might be a solution. Every situation is different, and the most important thing is to know your employees’ needs and how to best meet them. Having a color-coding program in place can help limit the language confusion found in food processing facilities. Less confusion means safer practices, and this means better food safety. This can add up to fewer recalls, which saves money. The core piece of advice Remco communicates to food facilities implementing a color-coding program is to keep it simple. A common paraphrase of Occam’s Razor is “All things being equal, the simplest solution tends to be the best one.” A color-coding program that is overly complex could become problematic for your facility and end up requiring more time and effort than it should, as well as involving more risk for cross-contamination. Determining what works and what doesn’t is easier with a simple color-coding plan. Food safety is a challenging endeavor in an industry with complex regulations, and color-coding is intended to simplify an element of it. Completely simplifying food safety is impossible, but color-coding can help, along with supporting the overall goal of meeting food safety regulations. Color-coding offers a method to intuitively keep tools organized and clearly communicate which tools belong in certain areas. Visual identification of equipment is quick when tools are color-coded. The foremost principle to remember regarding the simplicity of a color- coding system is to limit the number of colors used to what is absolutely necessary. For example, many food production operations have determined that only two colors are needed: one for “food contact” and another for “non-food contact.” A plan like this would ensure that tools used on the floor are easily identified as being different than those intended to be used on food and food contact surfaces. This type of simplistic plan is very easy to explain to employees and communicate throughout the facility. In cases when more than two colors are necessary, it is advisable to choose colors based on functionality. For example, some food production facilities employ processes that involve cooking raw meat. The potential for cross-contamination between raw and processed zones is a hazard that absolutely must be managed. Typically, two different colors are designated for raw and processed zones, and a third color is chosen to identify equipment designated for non-food contact areas. This type of a plan integrates more colors, but remains intuitive and should only require basic training for employee adoption. Color-coding can become a method to standardize processes within a plant or a group of plants. Some businesses choose to standardize processes to reduce waste and variation in the result. This type of standardization can be applied to cleaning tools and sanitation processes, and color-coding is a suitable fit for this type of model. For example, you could apply the same color-coding model across all production lines that run the same process within a plant. It can be taken a step further and applied across all plants that run the same processes so that only one training program needs to be developed and administered. Using a color-coding model that is not straightforward can create more of a need for specialized training. For example, a total color-coded red broom and handle is easier to identify than a specialized broom that mixes a green broom head with a red handle. A plan with combination color equipment will require more time and resources to train staff, especially if either color is used elsewhere in the plant. The whole premise of color-coding is to make tools easy to visually identify without the need for in-depth training. Using combination color tools robs a color-coding program of that intuitive simplicity and requires more resources than necessary for your operation to implement and adopt. It also increases the risk of cross-contamination if employees do not understand the program. When designing a color-coding program for your operation, remember that the ultimate goal is to ensure the safety of the food produced in the facility. For each color that you integrate into your plan, ask yourself if it is a necessary step in the process to effectively mitigate risk. If a color designation does not serve the purpose of managing a significant food safety risk, it is always the best practice to opt for simplicity. A plan that is overly complex is difficult to communicate and understand. A simple plan is easily adopted and becomes an intuitive method for managing food safety risks. A solid communication plan is essential to an effective color-coding system. With the proper communication channels in place, your color-coding system has the best chance for successful adoption—helping you mitigate the risk of cross-contamination. Communication should start at the top of the company and go down to each and every employee. When all employees are knowledgeable about the new or changed program, the chances of success are higher. The initial employee training communications must be clear and concise to ensure everyone is on the same page. When starting, or even revising, a color-coding system, employees must understand the reason for the change. Dealing with the threat of cross-contamination is serious, and the need to establish barriers to those threats is critical. The better every employee understands this, the more effective the color-coding system will be when put into practice. Communicating with employees on how color-coding can help with tool storage is also very important. Establishing procedures for storage can help with tool inventory management. If employees are taught the proper procedures for tool storage right out of the gate, this will go a long way in preventing any loss of tools or time. One particular way to help encourage proper storage is to use custom shadow boards that integrate outlines of the tools so that there is no question where tools belong. Many food processing plants use the 5S system to maximize organization. 5S is a Japanese-designed workplace organizational system that uses five phases: sort, set in order, systematic cleaning (or shine), standardize, and sustain. The use of color-coding is a natural fit for the 5S philosophy. Along with using shadow boards mentioned above, 5S helps encourage employees to properly store tools, maximizing their usable life. Daily communication to employees is essential to the longevity of the program. This starts with good signage. Clearly written instructions, multilingual if necessary, are essential to providing employees with instructions on the color-coding program. It may even help to include visual or graphic representations on the signage for each zone, for example, a picture of a peanut on the sign designating the color of tools intended for use with peanuts. In addition to written instructions, daily verbal communication is also vital. Any changes or revisions to the color-coding plan must be clearly communicated to all employees, from the top down. It is a best practice to include your color-coding program in your official regulatory documentation. Many regulatory bodies require documentation of certain procedures, and color-coding can become a great advantage for your operation. While color-coding is not required for compliance with any food safety regulations, it is looked upon with favor by auditors. Including your color-coding plan in the facility’s Preventive Control or prerequisite programs, which include Good Manufacturing Practices, Standard Operating Procedures, Critical Control Points (CCPs), and non-CCPs, will go a long way to ensure company-wide adoption, consistency and compliance with the program. For facilities that must comply with Hazard Analysis and Critical Control Points (HACCP) or Hazard Analysis and Risk-Based Preventive Controls (HARPC) regulations, including color-coding on those plans, is not required but is a best practice. HACCP is a food safety management system that helps identify and control cross-contamination threats. Similarly, HARPC requires identification and control of risks in food processing facilities. • Include a printout that gives details for reordering of tools, such as vendor, item number, manufacturer, etc. The final key to the success of a color-coding program is ensuring that it is completely integrated into the facility. If you have decided to take the plunge and start a color-coding program, or if you think yours needs some tweaking, remember that even a good color-coding program can be problematic if it is not uniformly applied. Ensuring complete implementation will improve internal adoption. Doing something halfway is never a good idea, and the same holds true for color-coding. When a color-coding program is implemented in pieces, the chances of success start to diminish. On the surface, it might seem easier to slowly bring in color-coding into your facility, but in the long run, it will be better for everyone to roll the program out all at once. Incomplete implementation might seem desirable due to a limited budget, time constraints or lack of manpower. However, having months of color slowly being added can prove confusing to employees. Once it is a part of everyday life at the facility, a color-coding program will be one more asset that you have at your disposal. If you read our last post, you know that communication plays an integral part of starting a color- coding program. Communication and complete implementation of the color-coding program go hand-in-hand. By communicating with every employee and team member, complete execution of the color-coding system will be that much more successful. One issue that might prevent a complete roll-out of a color-coding program is budget concerns. This is a valid issue, and one likely to be shared by many operations. However, because a successfully applied color-coding program can help decrease the chance of cross-contamination, and therefore recalls, it could save money in the long-term. Color-coding a food processing facility is an investment. Just like any investment, there are start-up costs—but the results will be well worth the money put into it. In addition to budget concerns, lack of time and manpower can also be issues standing in the way of fully introducing a color-coding system into your facility. Every food processing facility, from the smallest to the largest outfits, can benefit from a color-coding program. If time is an issue for you, ask Remco for help. 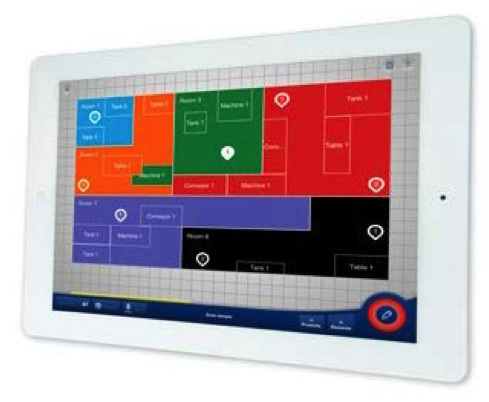 Remco and Vikan have tools that can help you quickly identify zones and plan the entire program for your facility. We’re here to assist you with the process and have many training programs that can smooth the transition for your employees.